As many as 24,000 people are killed annually by lightning strikes, with a yearly average of more than 50 fatalities in the United States. While up to 90% of strike victims survive, nearly 80% of survivors sustain serious, life-long effects such as neurological and internal injuries. Injuries don’t only occur from a direct strike by a lightning bolt, but also by making contact with an object electrified by lightning such as metal or the ground, as well as explosions or fires caused by the strike. Although the odds of you being injured are slim, it’s essential for everyone, especially hikers, backpackers, and campers, to learn and understand lightning safety. NOAA.gov makes it clear that there are no safe places outdoors when lightning or thunder are in the area. While the following article does provide safety tips for how to survive thunderstorms and lightning strikes when no safe shelter is available, the information serves to only lower the risk of being hit as there is no way to completely avoid it while outside. Always find a substantial, closed shelter in which you can ride out the storm, whether you see lightning or not, long before it reaches you. In mountainous areas, thunderstorms typically develop in the early afternoon. To avoid this, plan your hike in the morning and be off the mountain by noon. While enjoying the outdoors, you need to always pay attention to the changing weather. Look at the forecast before going hiking or camping and know the weather patterns of the area. Weather can change quickly, so always be mindful of the clouds. Dark underbellies, changing winds, and a scent of rain all indicate bad weather. The most obvious sign of a lightning storm, however, is thunder. Even if there is blue sky above, lightning can travel up to 10 miles horizontally before striking the ground. The best and only way to avoid lightning is to find a significant, closed shelter. Small structures like simple rain shelters, sheds, or outhouses provide nearly zero protection from lightning strikes due to the fact that they lack plumbing, wiring, or other grounding mechanisms from the roof to the Earth. Once inside a safe shelter, stay away from corded phones, computers, and other electrical equipment that put you in direct contact with electricity. Also avoid making contact with plumbing, metal objects, water, windows, and large amounts of concrete. Staying in a car is safer than being outside due to the metal roof and sides – if lightning strikes a vehicle it will travel through the metal to the ground. If riding the storm out in a vehicle, roll up the windows, don’t lean against the inside doors, and don’t use any electronic equipment. If you find yourself stuck outdoors in a storm there are some last resort safety tips, assuming there are no indoor shelters nearby, that may reduce your chance of being stuck by a lightning bolt. If you find yourself caught in the lightning storm, first of all, do not panic. Stay calm and take the proper immediate precautions. Quickly leave open fields, elevated mountain tops, and watery areas. Follow the instructions in the below table to know where you can find safety before, during, and after a storm. If There’s No Shelter, Where Should I Go? In the forest: Retreat to a group of small trees surrounded by taller trees or find a dry, low area like a depression or ravine. Avoid lone trees and other tall objects as well as rocky outcrops and ledges. In an open area: Look for a dry, low-lying area such as a valley and become the smallest target possible. Do this by crouching down with your heels touching, head between the knees, and ears covered. Minimize your contact with the ground and do not lie down flat. Anywhere outdoors: You can take shelter in a car or other safe shelter, but not a tent. In all cases, avoid bodies of water and areas that have high flash flood potential. Flash to Bang Method: 1) Count how many seconds pass between the flash of the lightning and sound of the thunder. 2) Divide the number of seconds by 5 to find the distance in miles (divide by 3 for kilometers) from you to the lightning (5 seconds = 1 mile). The idea that electronic devices and metal on your body attract lightning is a myth so don’t take the time to remove these items. However, “height, pointy shape, and isolation are the dominant factors controlling where a lightning bolt will strike” (NOAA). Therefore, metal objects protruding from your backpack, such as trekking poles or antennas, increase the chance of attracting a bolt of lightning. Stay away from any objects that could conduct electricity such as fences or power lines. In addition, if lightning strikes an object, lethal shrapnel could be sent flying. Staying low and finding protection can minimize the chance of injuries from debris. If you are with a group, crouch 20 feet apart to decrease the risk of multiple people being struck. Positive Streamers? You’re About to be Struck. Lightning strikes are preceded by a sensation of tingling or by your hair standing on end. If you have this feeling and are in or near a thunderstorm, your body has likely sent what is called a positive streamer. 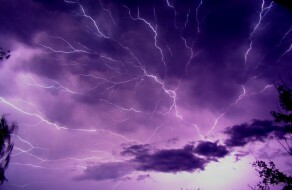 If this sudden charge connects with the electrons pooling beneath the storm clouds, lightning will strike you or within a very close proximity. If you feel this sensation, immediately crouch on the balls of your feet (follow the guidelines in the above table). 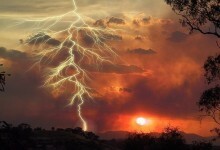 Hold your breath as to not breathe in the superheated air that surrounds a lightning bolt. If someone is struck by lightning, call 911 or seek emergency medical support immediately. Wait until the immediate danger of further lightning strikes has passed to evaluate their condition and to begin medical treatment on the injured person. Because the charge simply passes through the body, a person does not carry an electric charge after being struck thus making the person safe to touch. Follow the table below for instructions on how to treat those struck by lightning. After Seeking Medical Attention, What Next? If not breathing but has pulse: Begin mouth-to-mouth resuscitation. If there is no pulse: Begin hands-only CPR (watch instructional video). If breathing with a pulse: Look for possible injuries such as burns, broken bones, nervous system damage, or loss of hearing or eyesight. Wait for at least 30 minutes after the last clap of thunder to leave your shelter or to resume hiking or backpacking. Be aware of other thunderstorms that may arise after the initial storm.